This morning, as is often the case, the second intrusion of techno-melody found me rising from semi-consciousness with one profound—or so I thought—perfectly framed thought. One essential sentence! The next thought may have been my undoing: That’s it! That’s the next thing I’m going to write about! My “perfect thought-sentence” lingered only briefly as inspiration propelled me to full alertness. And faster than anyone can press “snooze”—woe of woes—it happened! The first half of my “perfect sentence”—the entire foundation of my “perfect thought” vanished! Thinking hard about it wouldn’t bring it back. The second cup of coffee did not refresh it, nor did the third. Concentration only pushed it further beyond any hope of recall. The second half of a profound thought, severed from its antecedent, must surely be the most worthless thing in the universe! Humankind’s common journey in our quest to understand God veers off course. We scatter into the maze of misunderstanding, voices raised with blame and accusation. This one expounds upon one “truth” while another insists on yet another “truth”. All the while, each may (or may not) have a piece of The Truth. Yet neither will draw close enough to one another to see whether they are holding two complimentary pieces of the same puzzle. As certain as one may be that one’s own “truth” is final, the further we go from one another, the more uncertain humanity’s understanding of God must inevitably be! Far too often, we make the love we are commanded to have and show toward one another conditional upon having the “right” doctrinal understanding of God. What a poor witness to the world. We, who claim to have the truth of God in Christ, fail to love one another as we argue over our little pieces of truth. The love of God should be the antecedent of all we can hope to attain in our understanding of Him. Ah, the vanity of doctrine separated from love, the living Source of relationship with the object of our doctrine! The picture of truth we grasp through faith is incomplete! How can we write or talk or argue about a God who is the Beginning and the End—indeed, without beginning or end—when we can’t even keep two halves of one thought together? He is bigger than all our fractured thoughts combined. Today, what we understand is like the thought of God that comes to us after we hit “snooze”—while we’re still half asleep. Our best thought isn’t perfect. The harder we try and the more we argue about it the further we get from His thought! But if we continue loving one another and pursue Him together, then someday it’s all going to make sense! We’ll wake up remembering exactly what God—who knows everything about us and still loves us—wants us to know, and it will be the perfect thought-sentence about Him. We will know the truth—Beginning to End, Without Beginning or End! My friends, I am going to have to remain here in Zarephath—my place of total dependence on Him—as we journey together to other places at the same time. 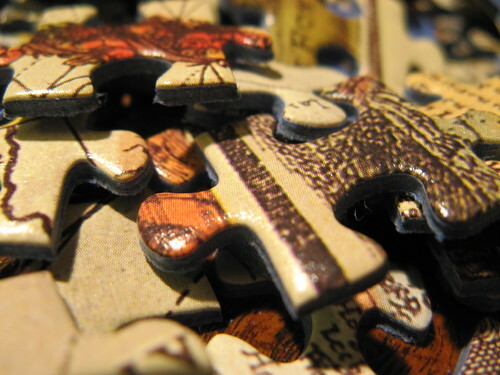 May we find, in each place we visit, a puzzle piece that enlarges our view of our Lord! I invite you to comment and share a piece of the puzzle! « How Do You Like The Ring Our Father Gave You? One of God’s great gifts, it seems to me, is His enlargement of our hearts and minds so that we trust all the mysteries concerning Him. He is the revealer of Himself. Ours is to receive His revelation, live in it, and delight in Him! We get ourselves into all sorts of trouble when we try to “reconcile” mysteries into statements that we can manage, or with which we can feel comfortable. God doesn’t “fit”! Why would we want Him to?!!!! I agree, Jim! We can’t put God “in a box” and it’s vain foolishness to try. No doctrinal construct really even comes close. But as we come together and we each bring Him living in us He does indeed prove to be the revealer of Himself! Bless you for that comment!